To facilitate and assist parents/guardians to organise and prepare for their child's baptism into God's family. This work is done when the need arises and on an individual basis with the family, whose member is to be baptised into the parish family of St Theresa’s Parish Plimmerton. The process strives to encourage the family to full and active participation in the process and ceremony of baptism and the ongoing life of the parish. At its heart is the understanding of parents/ guardians as the first and best teachers of the child's Christian faith and relationship with Jesus. Parents/guardians are guided to make an informed decision about baptism. 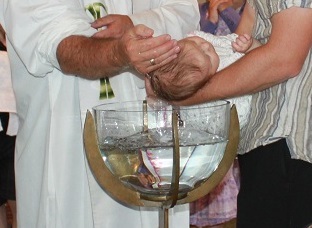 Parents are encouraged to have their child baptised during Eucharist. This, we feel, is the best expression of God's family that the child is being welcomed into. Ceremonies are celebrated during Sunday Eucharist celebrations at times convenient to the family and the parish.